Written between the 13th and the 20th centuries, the Timbuktu Manuscripts cover topics such as art, medicine, philosophy and science. They have been preserved for centuries in private households in Timbuktu, Mali. When they were threatened during the crisis in 2012, SAVAMA-DCI organized the evacuation of hundreds of thousands of manuscripts to Bamako, where they are being researched and catalogued. 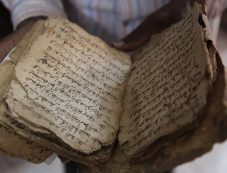 Help preserve this cultural treasure through the American Friends of the Timbuktu Manuscripts.